Sarazen Lane #4 is 3700 sq ft with 2 levels that allows for privacy with multi family stays or gather everyone around the dining table for a feast made in the large fully stocked kitchen with amenities that home grown chefs dream of including granite counter tops! The large living room focuses on the beautiful stone fireplace and large flat screen TV with free cable a large selection of games, movies, books and free WIFI for hours of entertainment! Sarazen 4 also includes a XBox with four controllers. 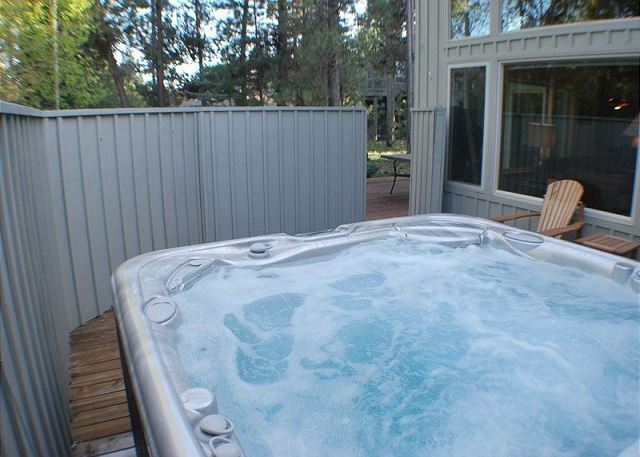 4 master bedrooms are downstairs, one master has a large soaking tub! 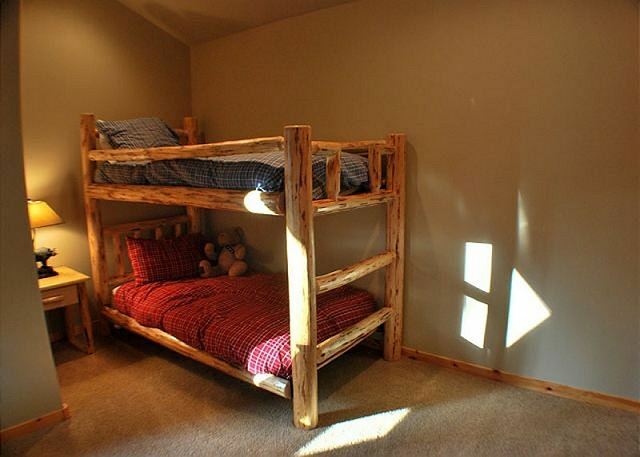 The 5th master bedroom is upstairs adjacent to the large loft area with a bunk bed. The loft at Sarazen 4 serves as an entertainment hub with air hockey table, PacMan Cocktail Table (for children of the 80s! ), foosball table and lots of games to keep kids of ALL ages busy and having fun. There is a ping pong table in the garage. There is a long driveway which can accommodate multiple vehicles. 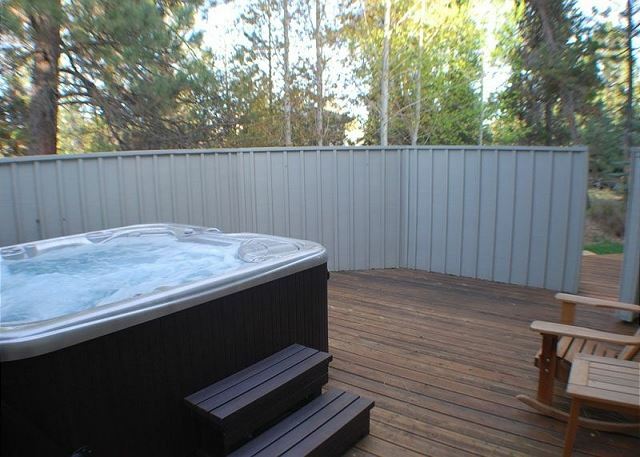 The large deck presents a private hot tub and gas BBQ. 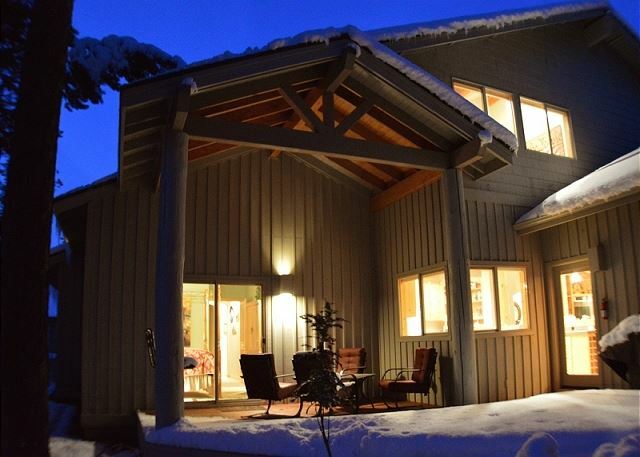 This home provides 12 Unlimited SHARC passes, free tennis, free access to the Sunriver Marina and a free ski shuttle to Mt.Bachelor in the winter months. 5 Master Bedrooms with 3 Kings, 2 Queens, bunk beds in loft area, large soaking tub in downstairs master bath, Cable TV, WiFi, 7 TV's/4 VCR's, 6 DVD players, air hockey table, games, movies, books, gas fireplace, private hot tub, 2 level home, microwave, large pantry with 2nd refrigerator, laundry room, basketball hoop, BBQ, D/W, W/D, garage, bikes, near Woodlands Golf Course, 3700 sq ft and 12 Unlimited SHARC passes. Thank You for the 5 star Review, Jerry! Glad your experience was a good one! Come back soon! Wonderful home, looking forward to the "next time"! Thank You for your 5 star Review, Kris! So glad you had a great time and are already looking forward to next time! See you in Sunriver! Our family had a wonderful week vacation in Sarazen #4. 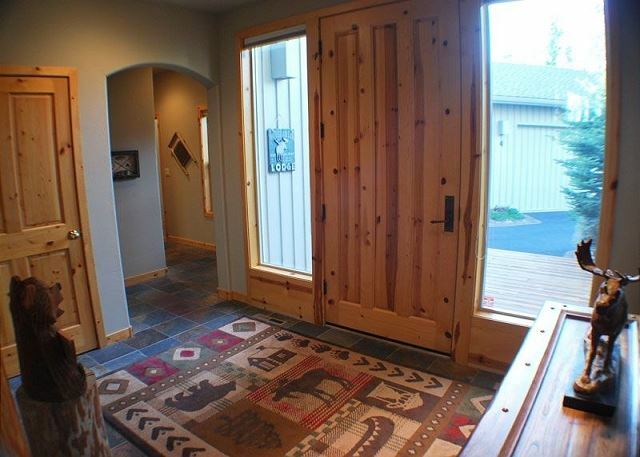 It is a beautiful home & exceeded our expectations! Thank You for the 5 star Review, James! We are so glad to hear that Sarazen 4 exceeded your expectations, Come back soon! It was perfect. The house accommodated our entire family with room to spare. It was in a great location, very clean and whenever we needed anything from the property management company they were right there. WE will be back. Thank You for the 5 star review, Marjo! So glad that you enjoyed your stay and want to come see us again! Awesome! 15 bikes with helmets provided! Pictures don't due this house justice...fantastic. It's a little far from the main Sunriver pool but right next to the driving range...Good trade off. Only thing was there weren't enough bath towels provided (only 10). Thank You for your review, Doug! 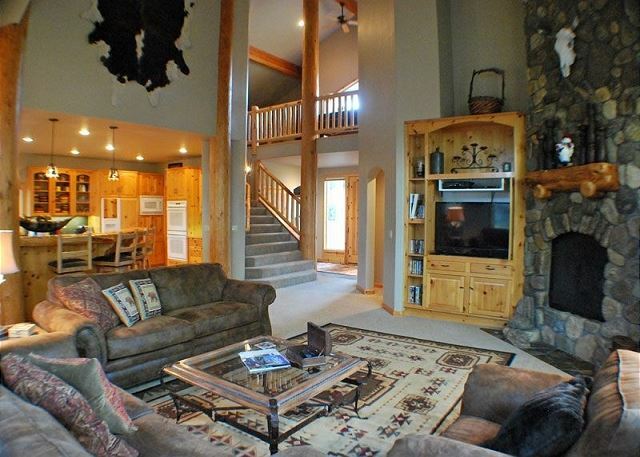 We agree Sarazen 4 is so hard to capture in pictures - The home is FANTASTIC! Please give us a call anytime you find something that could make your stay more enjoyable - we would have happily brought out more towels to your group! Hope to see you again in Sunriver! Adventure pals ski weekend. Annual getaway for a group of 8 skiers. 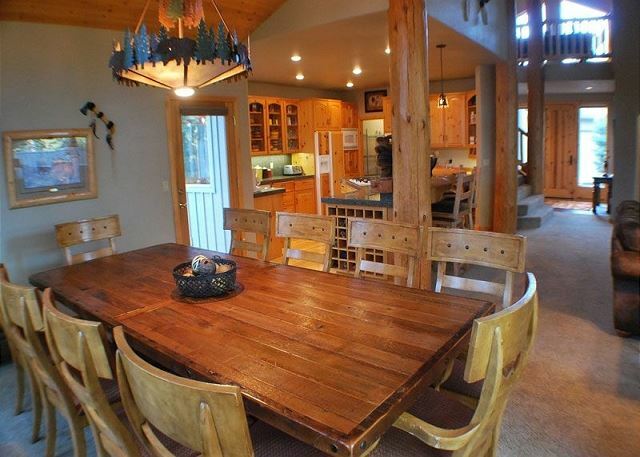 This home offers a dining table and gathering area that comfortably accommodates everyone as a group, and has our favorite amenities with 5.5 bathrooms, a hot tub, bikes to borrow and overflow bunks in the loft. And, it takes fully equipped kitchen to a whole new level. But, don't book it on our annual dates because we want to return every year!! The house was had a very well equiped kitchen and all bathrooms with each bedroom was wonderful. Plenty of room for everyone. Thank You for your great review Cheryl! We are happy to hear that you enjoyed the spacious well equipped Sarazen 4, we hope to host your group again soon! Our extended family spent Thanksgiving break 2017 at Sarazen 4 and had a great stay. 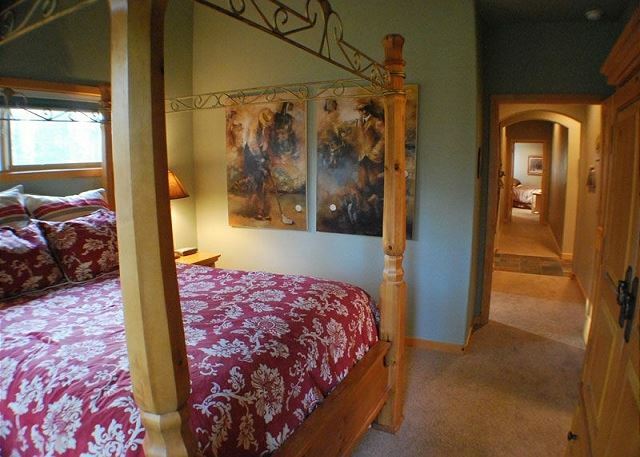 The 5 bedrooms with attached bathrooms provided sufficient space for all 8 of us from three generations to spread out. And the great room / kitchen was high end and comfortable for us all to come together. 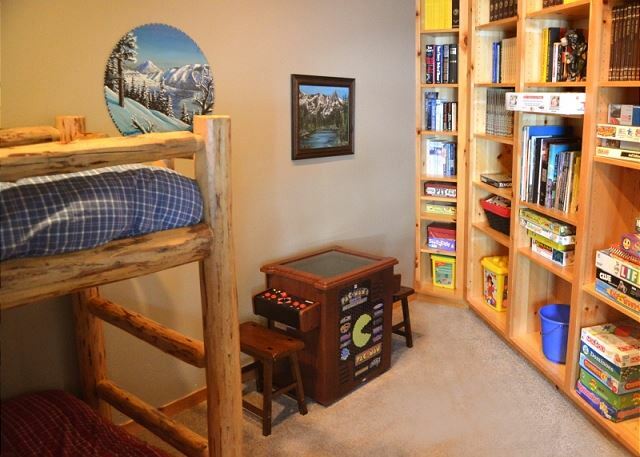 Plus the house is stocked with games and gear that kept everyone entertained. We would definitely rent Sarazen 4 again, and from Sunset Lodging. Thank you for reviewing your stay at Sarazen 4! We're so glad you had an enjoyable experience and that you would stay here again. 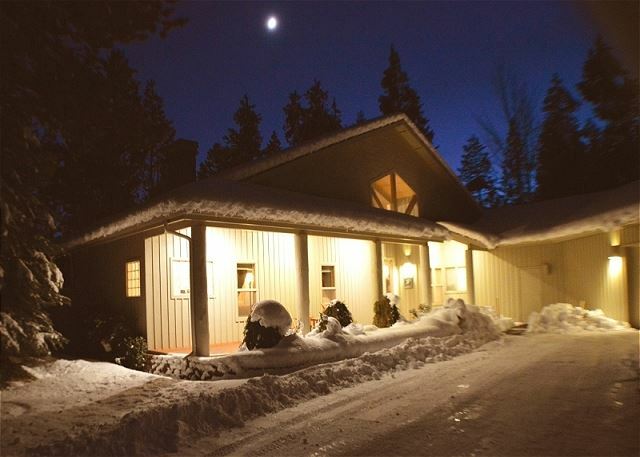 At Sunset, we look forward to your next visit to Sunriver and the opportunity to help you find the perfect backdrop for your extended family vacation. See you in Sunriver! Our Choice Four Years in a Row! 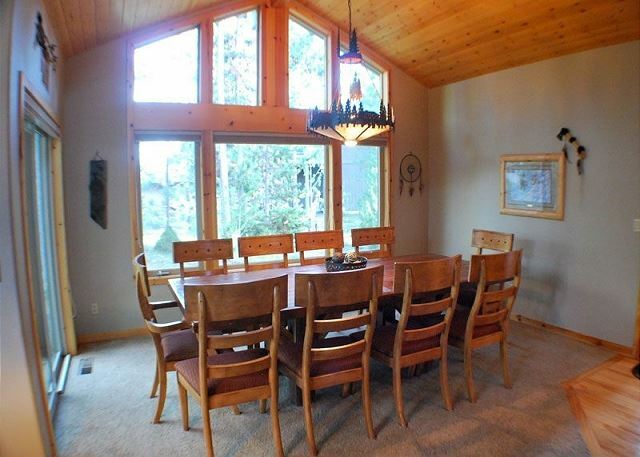 This lovely home accommodates five crazy quilting ladies for a week every fall. We love the well-appointed kitchen, huge pantry, comfy beds and super-clean environment. Thank You for your review! Patricia we love that your group is so comfortable at Sarazen #4 and love that we get to be a part of your yearly tradition! See you soon! 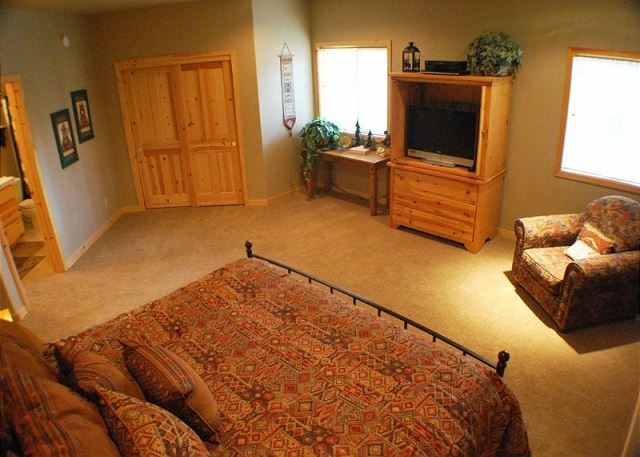 These accommodations were A-1 in all of the areas that anyone would need to have an enjoyable time in Sun River. Thank you so much for your review Gary! We are happy to hear you enjoyed your stay in Sun River at Sarazen #4. We can't wait to have you join us in the future! 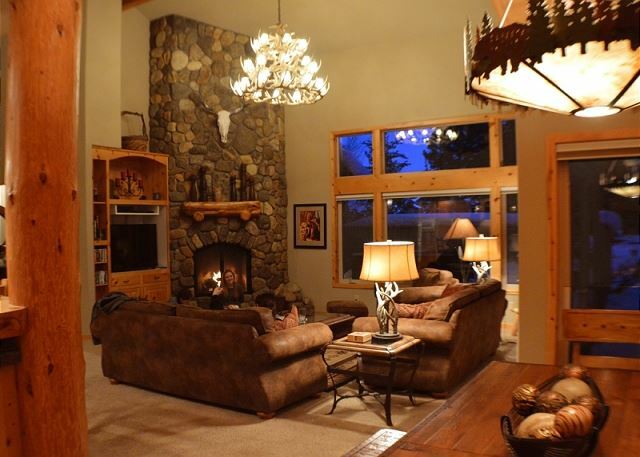 This home was a beautiful and comfortable place for our our multi-generation family gathering. We had guests from ages 3-84 and there was something to do for all of us. The kitchen was well stocked, the furniture and beds were comfortable, and there was plenty of room for all of us. We are so happy that you enjoyed your stay at Sarazen 4 with your family. Thanks for such a wonderful review and hope you come visit us again soon! We enjoyed the home but I would have someone look at kitchen faucet it is not letting adequate water out, slows down clean up. Coffee maker probably ready to be replaced. Showers never got really hot, possibly hot water tank needs turned up. Thanks for your feedback, Scott! It is SO important to us that our guests share these observations so we can continue to get better. We will have our maintenance team check on each one. Thanks kindly and we hope to get to see you back in Sunriver soon! Sarazen #4 is a beautiful home, very clean, and well maintained. Our group had a wonderful and relaxing visit there. Sunset Lodging was very professional, and very helpful. This is the second year in a row we have rented this home. There are 8 women in our tennis group and this house works perfectly. The location is perfect as we can walk to the North Courts. All bedrooms have their own bathrooms which is quite helpful in a house full of women. One of my favorite parts of the home is the storage room off the kitchen which not only has lots of shelves for extra food but it also contains another fridge/freezer for beverages. 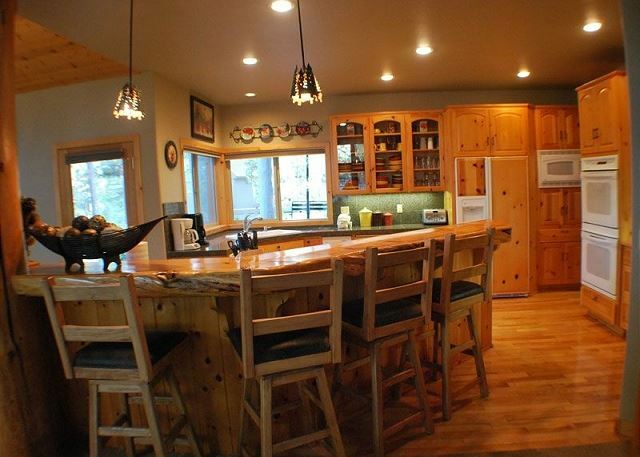 The kitchen is spacious and we all love the large dining table along with the bar seats. Great House! We so glad to have the privilege to host you two years in a row, Teresa. And we're counting the days til you get back to Sunriver. Thank you for being great, loyal guests of Sarazen 4 and Sunset Lodging. We really enjoyed the home and it was plenty big enough for our entire family!!! We will definitely be back! Hurry back, Laura!! And thanks for your feedback on Sarazen 4, it is definitely a favorite among our bigger groups! Our family had an absolutely wonderful time in Sunriver. Our house was beautiful & very comfortable for everyone. We will certainly consider renting it again whenever we need one that large. The bikes were in excellent condition. We put many miles on them! It was a great 80th birthday celebration! James, we are SO GLAD to hear that you chose Sarazen 4 for such a special occasion! We hope to get the privilege to host all of your special occasions, big or small. Thanks so much for your feedback and we hope to see you back in Sunriver soon. Excellent accommodations. A bathroom for each bedroom a luxury. Would definitely stay there again. A great selection of games and activities. Thanks for your feedback on Sarazen 4, Mike! It is one of our finest homes and we are so glad it worked well for you. We look forward to your return! We had a wonderful time. All 5 daughters and their husbands/boyfriends and our first grand baby all made it for parts of the week. Lots of cooking, biking, and good family time. Great place! We loved it. Comfortable and spacious. We really like this house. It was big enough for all of our guests and gave everyone some privacy at the same time. There was plenty to do in the house--from games, to movies, to biking with their bikes (and helmets), to playing basketball, ping pong, etc. The only drawback is the difference in the size of the bedrooms. 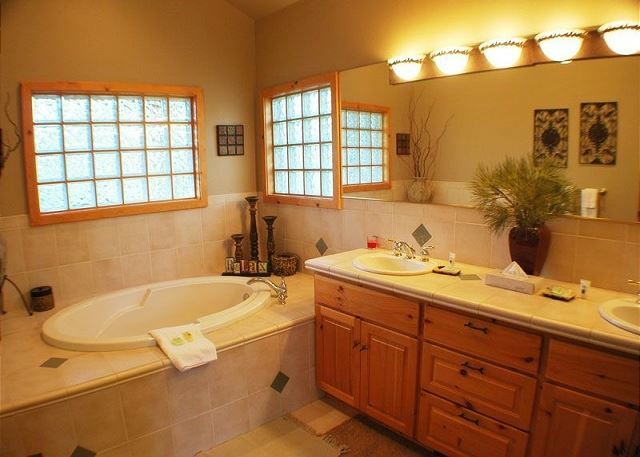 All 5 bedrooms have their own baths, which was ideal, but 2 of the bedrooms were large and 3 were small-ish. But I recommend this house. I would stay there again. Terrific for a big group! One of the things that drew us to this property was the number of bathrooms. 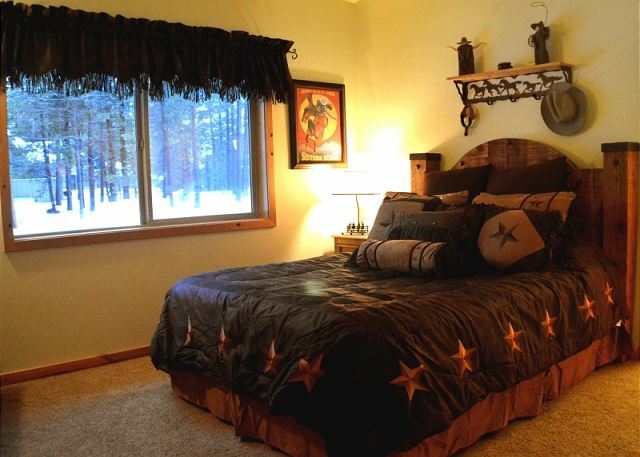 Many VRBO properties tend to be awkward with bedrooms off the garage cold and damp… This is not one of them! We are so glad to hear this, Teri! Our visiting families mean the world to us, so to have yours pull off an awesome holiday is our ultimate goal. 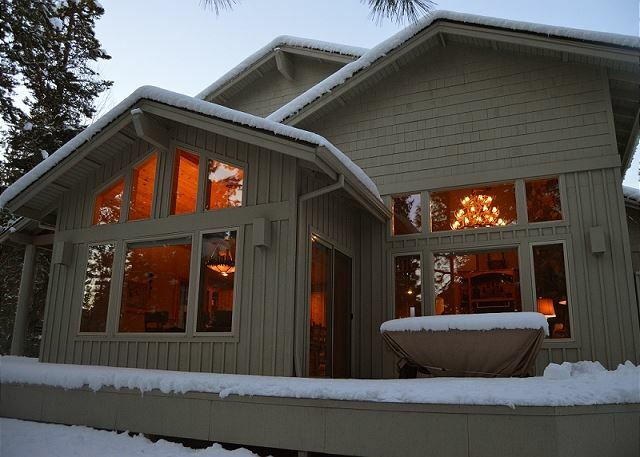 We hope to have you back in Sunriver again soon! 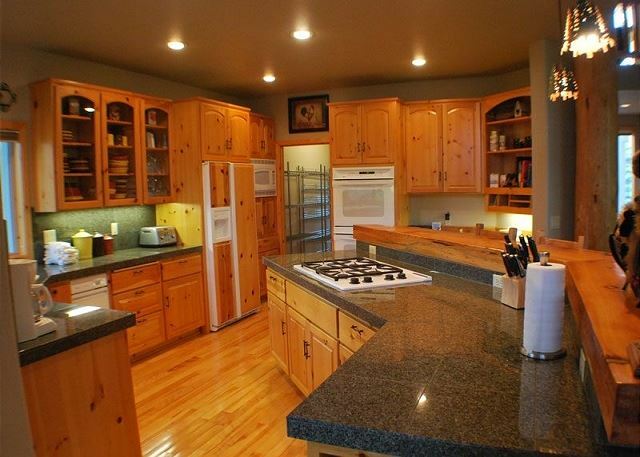 This is a lovely home with a very well-appointed kitchen. Five of us have stayed here before, and keep coming back. Clean, comfy, in a beautiful setting. We couldn't agree more, Patricia! 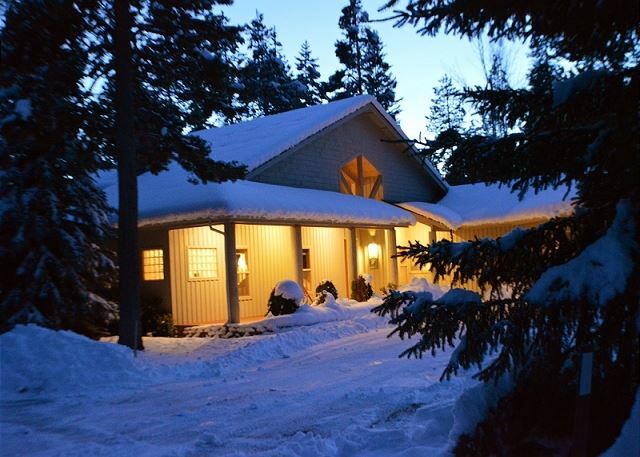 The owner of this home strives to keep his guests happy and it really shows in Sarazen 4. This home is our most popular 'foodie' home for the exact reason you mentioned - the very well-appointed kitchen! We will look forward to your return to Sunriver and Sarazen 4! 8 guys in town for a mtn biking vacation. As usual, the riding was fantastic, including the snow storm we rode in on Saturday morning. This is the 4th time we've stayed at Sarazen 4. 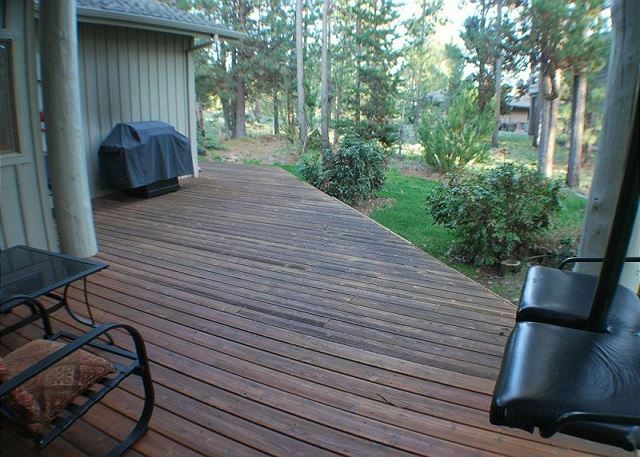 It is one of the nicest places to rent in Sunriver. 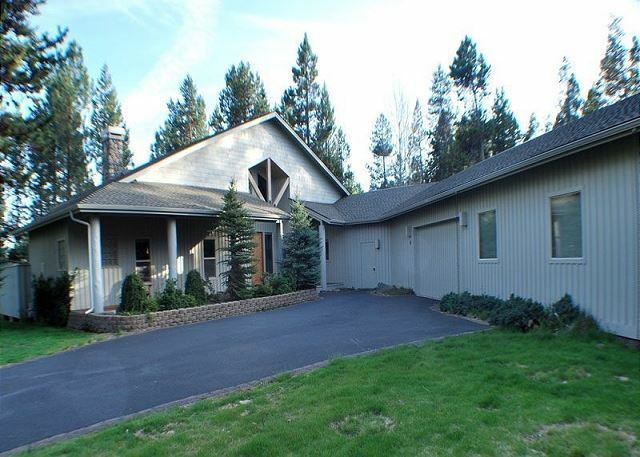 Its big, clean, nicely appointed and nicely located at the north end of Sunriver. 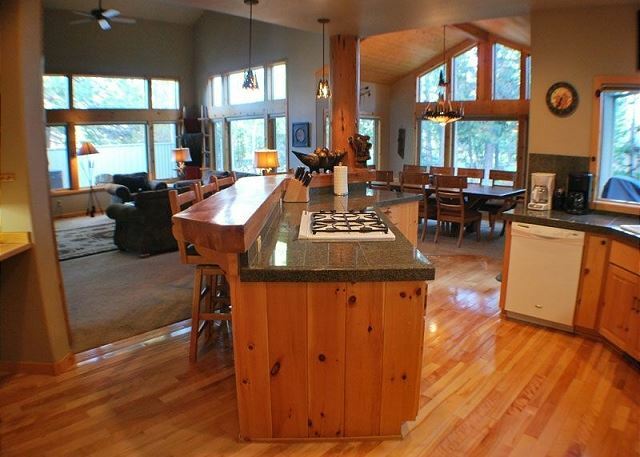 I especially enjoy the open kitchen, dining room, living room. 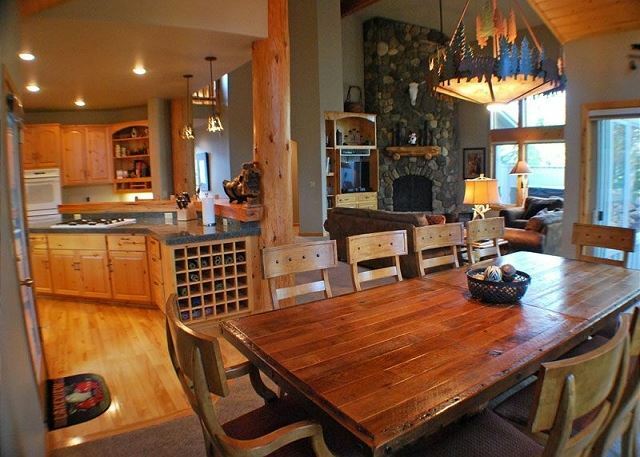 Its great space for gathering while we cook extravagant meals. We are a group of foodies and are particular about kitchen ware and Sarazen 4 meets our high expectations. 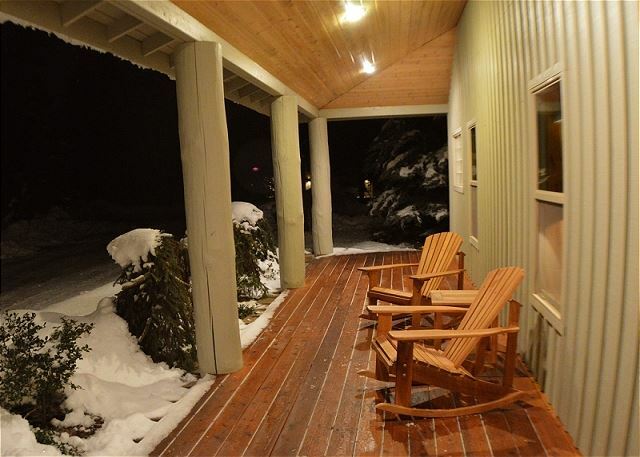 The back porch and hot tub are private and very nice. The folks at Sunset lodging are very professional and helpful. Wow Jay!! Thanks SO much for these kind words and excellent feedback. It seems that your group of guys is a PERFECT match with Sarazen 4 which is our greatest goal as a vacation rental business. I am SO glad to see the 'foodie' review because we literally (yesterday) discussed this with the owners of the home and decided to feature Sarazen 4 in some foodie marketing campaigns that we're going to do headed into the holidays. Thanks for confirming what we were thinking!! And please hurry back to Sunriver, we look forward to your next visit! We were a group of 9 ladies of various ages. The house worked well for our needs. Loved the location and the layout of the house. The dining room table was amazing! The only change I would suggest is to replace the shower head in the "golf theme" bedroom. Had to run around in the shower just to get wet! Really rough to get the shampoo all out of your hair! Other than that it truely is a wonderful house! We plan on renting it next year as well! We were so glad to have you gals here in Sunriver, Teresa! And even more glad that you enjoyed beautiful Sarazen 4. We have good news about that shower head - it has been replaced along with some other maintenance that the owner did to fine tune the house. Thanks so much for sharing the feedback, it really does make a difference. We sure hope you'll get back to Sunriver and Sarazen 4 soon. We'll keep the place sunny and beautiful for you!! Spent a week in Sunriver with both my sisters and their families. There was 12 of us and the house was perfect. I'm giving this review all 5 stars because it really was great overall. Our only complaint was wifi - service was weak, slow and/or nonexistent. We will only stay here again if that is improved and the new owners decide to change their views on allowing pets ???? We looked forward to enjoying this home again this year, appreciating the location, spacious design, which allows privacy for the adults and secluded bedrooms for children/babies, and well stocked kitchen. We were very disappointed to learn the North Pool is no longer available to guests, so this may be a deterrent to our return next year, as SHARC is not a relaxing experience for those of us who want to just enjoy a quiet afternoon at the pool. The North Pool restrictions have been a real problem this year, Mary Sue, and we apologize that it hindered your stay! If/when you make your reservations next year, make a point to ask for an update. We're not sure if the SROA is going to keep the current policy in place or make a change for next year. We hope you come back soon and thanks kindly for your feedback! We had a very good time at Sunriver. The house was fabulous. There were bikes in the garage and we swam, biked and hiked. The only drawback was that you advertised air conditioning. We could get nothing but air circulation and no cool air conditioning. Even though we requested maintenance staff to review the situation several times. It got quite hot on the second floor. We saw notes of complaints of the same thing from prior tenants. I don't believe that the home has a functioning air conditioning system. We did have a failed compressor for the a/c unit at the beginning of June. We replaced the compressor and our maintenance staff checks the temperature at all 11 vents in the home before every check in to ENSURE that the a/c is working. Our maintenance crew advises that this case may have been a matter of setting the thermostat properly which we did as soon as we heard you were having trouble. We've not had any problems since the compressor was replaced, so we're hopeful that the a/c issues are finished. It seems like you folks really enjoyed the home otherwise, so we'll hope to see you back again next year! Plenty of room for everyone. Lots of food storage and pantry came in handy. Only bad thing was that the A/C unit was broken our entire stay and it was 100 that week. Boy, you are not kidding about that heat, Molly. Although highly unusual for Central Oregon, we do get an occasional heatwave that just wreaks havoc. And so it is the case with your air conditioner. It was installed in February during Snow Season. It didn't really get a good test until your visit at which time the compressor failed. We are in the process of installing a new one. We hope you were somewhat comforted by fans and evening breezes and further hope you'll return to beautiful Sarazen 4. We are so glad to hear that you found it well appointed and good for a group as those were the owners intentions. Thank you for your feedback, Molly! This house was beyond spectacular! So much room and 5 master rooms. Great for multiple families. 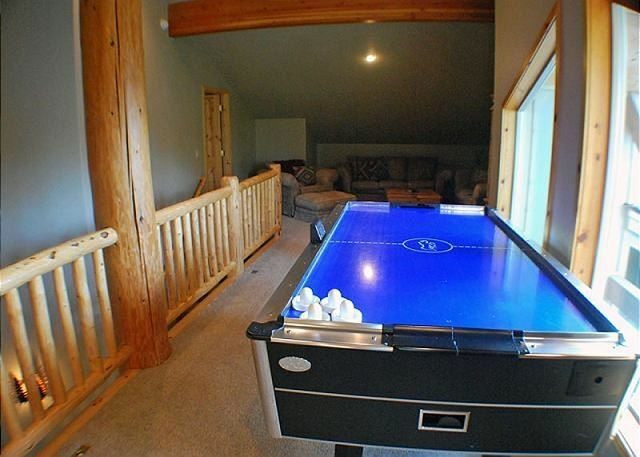 Beautiful decor and a fun loft with air hockey. So glad you liked Sarazen 4, Kathy! 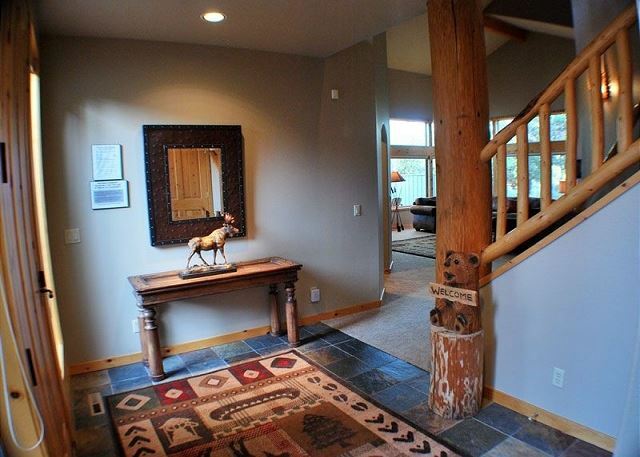 This property seems to fit traveling families perfectly! We hope you'll get back to Sunriver and Sarazen 4 again soon. Very nice place for our family. We like to cook together and it has a nice large kitchen. Deer come to back deck. A very nice place. 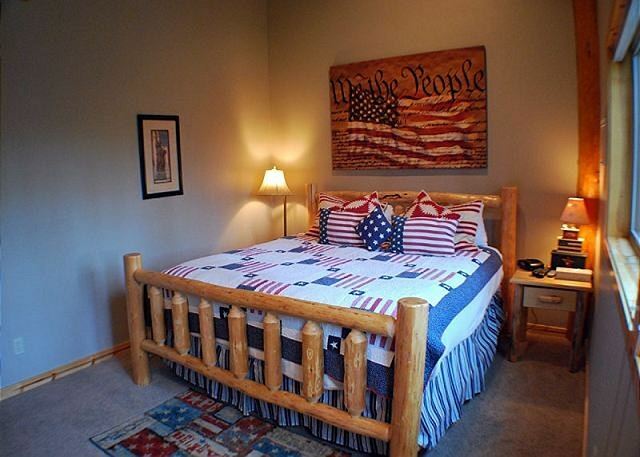 It was very clean and accommodated our group with no problem. The location was perfect since we are golfers. Management was very responsive to our requests from the start of the reservation process to fixing a television. I suggest that they have a couple of adult bikes with more than one speed. The master bdrm shower door needs fixing and the shower nozzles are not good. That said, it was excellent. We have already recommended it another family. 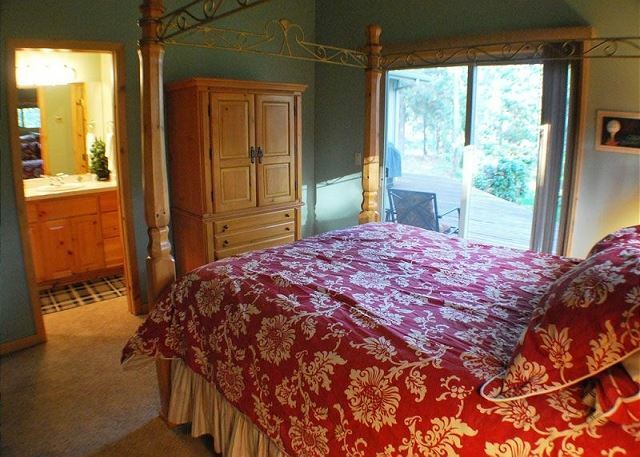 It was great to have five bedrooms, with king and queen beds, each with their own bath. Lots of parking space and a loft with twin beds for kids. The kitchen was well stocked and made cooking a breeze. Everything we needed was available. This home was an absolute delight! The photos online certainly do not do the home justice. 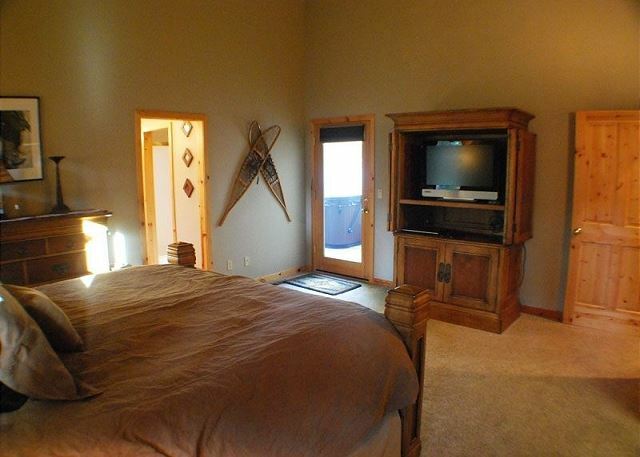 There are five bedrooms, each complete with their own bathroom; and a separate loft space with couches, T.V. and one set of bunk beds. We had four families and eight children and this home offered plenty on room for all of us, including a basketball hoop in the driveway and a grassy area for the kids to run. The main kitchen/dining/living area was plenty big for everyone. Would definitely rent this home again. This is house fits us perfectly. 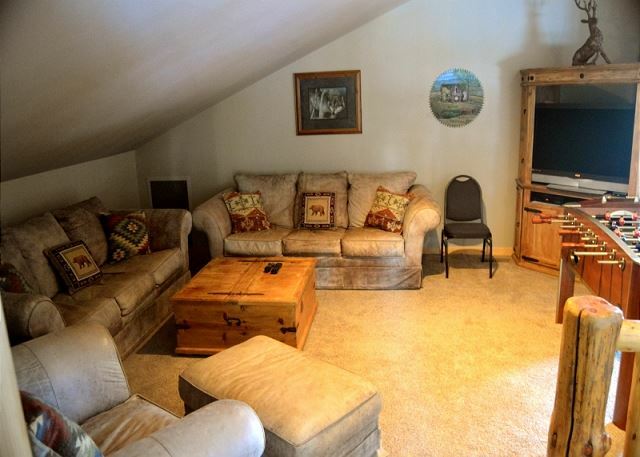 We love the room layout, the upstairs area for the kids, the front porch and ease of watching kids ride the loop, and the spacious kitchen/pantry. The only addition we'd really enjoy seeing is another refrigerator in the garage area. We love to cook as a whole family so we often have the fridge in the kitchen jam packed so an overflow refrigerator would be a great help. Other than that, we love Sarazen 4! Thank you for your review! We are happy to hear that you enjoyed Sarazen 4 and that it fit your group perfectly! 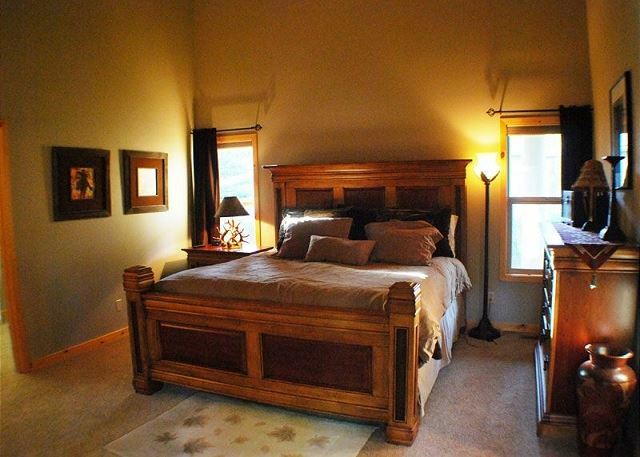 The layout in this home is great for families and we are glad that you agree! We hope to see you again soon! The house was large enough for three families. It was very well equipped. Great place!